The second Alamo Grammar School, at the northwest corner of Stone Valley Road and Danville Boulevard, was remodeled several times. In 1904, 61 students were enrolled. The community of Alamo had one of the earliest grammar schools, through the efforts of Mary Ann Jones, who had moved to Alamo in 1851. As a young student, James Smith attended several of the valley’s early schools and recalled Webster was popular with the students. Smith wrote this about the Alamo School: “This first school building was located just west of where the Alamo cemetery was later located, near the San Ramon creek. The lumber was obtained from the redwoods west of Moraga and residents contributed for the cost of materials and hauling and the labor. 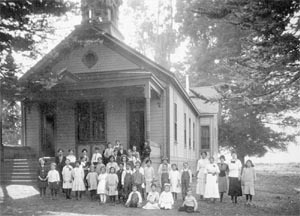 The school was built with rough lumber, having single desks built along each side with seats for the same, a long low table in the center, and a number of benches. The teacher’s desk was at one end and was on a platform about four feet high, to serve as a pulpit when the school was used for religious services. In later years, three Alamo Grammar Schools were built near today’s corner of Stone Valley Road West and Danville Boulevard. The 2-1/2 acre property on which these schools were located was sold for $200 by Mary Ann Jones to be used for school purposes in 1876. The first one was built in 1871 and was destroyed by fire in 1893. The second Alamo Grammar School originally had a bell tower. It was remodeled several times over the years. The tower was removed and the bell placed in the outside yard, presumably because of concerns the tower might fall in an earthquake. In 1904 there were 61 children enrolled; in 1908—68; and in 1911—50. Astrid Olsson Humburg taught in this school in the late teens and early 1920s. In 1921, after fundraising by the Alamo Community Club, a large playground apparatus was built, including swings, a sandbox, basketball and handball courts (leveled), plus a baseball diamond mapped off. But the school itself began to show its age. The school was extensively remodeled in 1924. Alamo residents discussed joining with the new Danville Union District about the same time but voted against it. Some of the parents sent their children to the new Danville school. In 1934 the cloakroom was torn out and the front porch enclosed to make another classroom. Efforts to pass a bond issue for a new school were defeated in 1935, an attempt was made to get a WPA loan, and plans were made but nothing was built. Finally, in 1940, a $20,000 bond issue was passed and the third Alamo Grammar School was built on the same site. As with the earlier schools, it was an important part of the community and for 25 years was used for voting, social gatherings, dances and card games. From 1958-59, Alamo School had so many students that rooms were rented at the Methodist Church to accommodate the growth. Today’s Alamo Elementary School at 100 Wilson Road opened in 1965. It has the original school bell in its courtyard. The bell has a San Ramon Valley Historical Society plaque that commemorates the history of early education in Alamo.